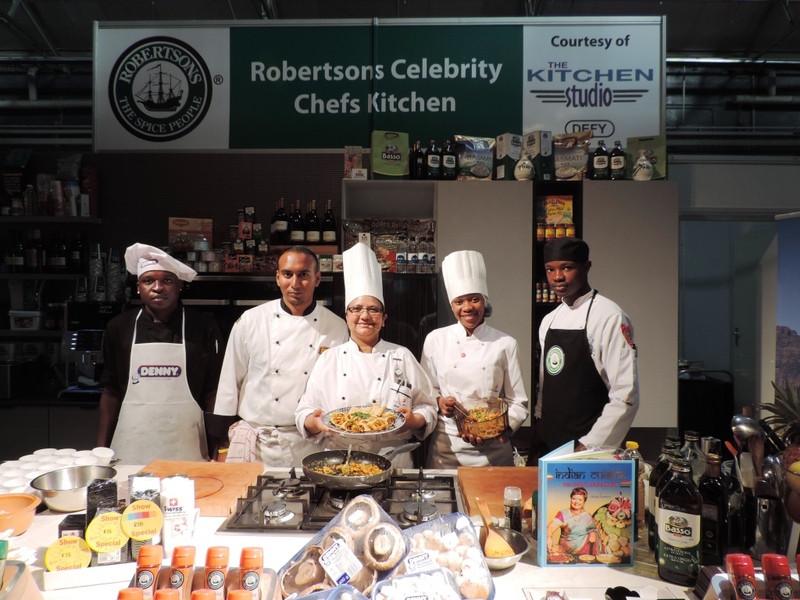 Robertson’s Spices hosts a Celebrity Chefs Kitchen at the East Coast Radio House and Garden Show annually. 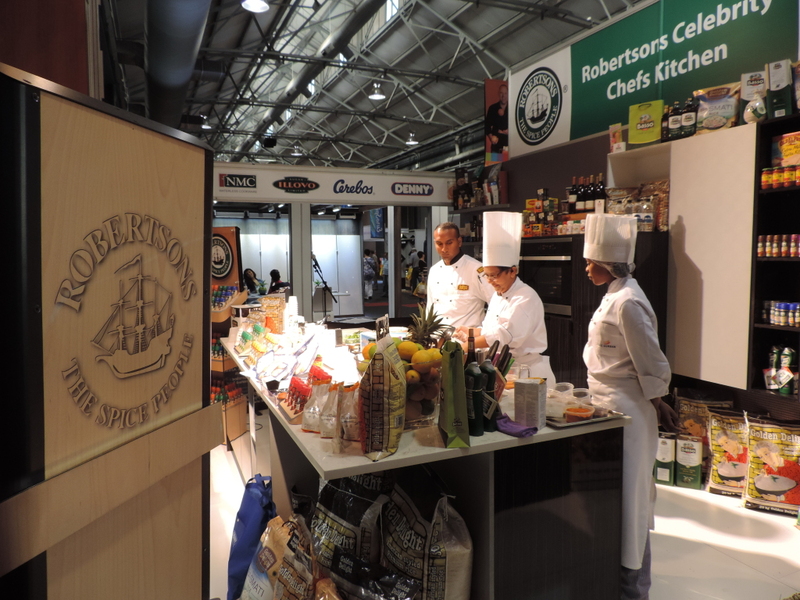 This year Sheila Somers, the Durban ICC’s Specialist Indian Cuisine Chef, was invited to teach a Master class in Indian Cuisine for a crowd of eager culinary enthusiasts. Each year, a select group of chefs is invited to host a series of live cooking sessions in the Celebrity Chefs Kitchen. During each Master class, the chef is required to prepare a speciality menu in front of the live audience. To add to the appeal, the entire menu needs to be prepared from scratch in under an hour. During her sessions, Sheila chose to prepare an assortment of winter snacks for entertaining. The menu included mini pittas with a spicy seafood stir-fry and vegetable Jalfarezi filling. Sheila is no stranger to the spotlight. She a respected chef in her field and has published several books on Indian Cuisine. She has presented numerous segments for television and wrote a weekly column for The Post newspaper for over 20 years. Sift dry ingredients in a bowl. Combine yoghurt and oil and add a little at a time to the flour and mix to firm dough. Cover with a polythene wrap and rest in the bowl for 10 minutes. Roll dough into a long sausage and cut into equal portions. Roll each portion into 8cm rounds and 2 mm thick. Heat oil in a thick-based pot, of at least 20cm diameter till it reaches 180 degrees Celsius. Fry pittas 1 at a time until puffed turning over once. Drain on paper towel. Whilst hot cut into half with a kitchen scissors. Melt butter in a non-stick pan. Add mustard and cumin seeds, when the spluttering stops, add onion and curry leaf. Sauté for a minute then add ginger/garlic and peppers. Sauté for few minutes then add curry powder, all the seafood and salt. Stir-fry on high heat for 5 to 6 minutes. Add cream and simmer for few minutes, sprinkle chopped coriander. Spoon seafood stir-fry into the sliced pittas and serve. Chicken breast can also be substituted for seafood. Prepare exactly the same. 300g julienned vegetables consisting of red pepper, green pepper, zucchini, mushroom and brinjal. Melt butter in a non-stick pan. Add mustard and cumin seeds, when the spluttering stops add onion and curry leaf. Sauté for a few minutes then add ginger/garlic and spices, stir and add all the vegetables and salt. Stir-fry on high heat for 5 to 6 minutes then add cream. Cook further for few minutes and sprinkle chopped coriander. Spoon Vegetable Jalfarezi into sliced pittas and serve.